I took the family on a quick vacation this weekend. Off to the beach we went. 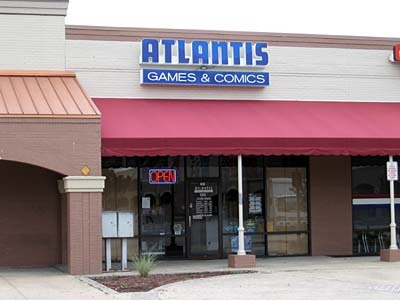 I managed to steal a few minutes to stop in at the local games store, Atantis Comics down in Virginia Beach while the Wife was off doing some shopping. For a Saturday evening, they looked they had a good turn out, half a dozen or so gamers playing and painting. The terrain looked a little dog-eared but I suspect that's from a lot of good use. I was pleasantly surprised to see their selection of hobby supplies too. They had a good variety of stuff there, along with some things you don't see often. One day, I'll take my army with me and maybe get a game or two in when I visit. For now though, it's a long, hard push through my email inbox to sort out everything that has collected in the past few days. So if you've emailed me or sent something in, I'll be getting to it tonight. Tomorrow is a big work day for me with some commissions, so look for lots of updates this week. Ron, how was their GW selection? Was it about the same, more, or less than what we have at GV? We're trying to get listed as a GW premier store (we meet the organized play requirements) and AC is already so we want to gauge against them before we count inventory. I would say it might have been just slighty more than what you guys have. But it looked more picked through and not yet restocked more than anything else. There was lots of room for items, just not too much on the wall. I'm still anonymous enough that I can walk into places and nobody recognizes me... now GV is another story but then again, that's why I love the place so much.